The Legend of Zelda: Ocarina of Time (ゼルダの伝説 時のオカリナ Zeruda no Densetsu: Toki no Okarina) is an action-adventure video game developed by Nintendo's Entertainment Analysis and Development division for the Nintendo 64 video game console in 1998. Originally developed for the Nintendo 64DD peripheral, the game was instead released on a 256-megabit (32-megabyte) cartridge, which was the largest-capacity cartridge Nintendo produced at that time. 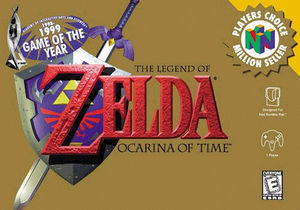 The fifth game in the Zelda series, and the first with 3D graphics, Ocarina of Time introduced many of the common elements of 3D adventure games still in use today. The title is widely considered by both critics and gamers alike to be the greatest video game ever made. Ocarina of Time has had four major re-releases, the latest being on the Nintendo 3DS. It was originally ported to the Nintendo GameCube alongside an Ocarina of Time Master Quest (which featured reworked dungeons with new puzzles), and The Legend of Zelda: Collector's Edition as a direct port. It was also ported to the iQue Player in 2003 and the Wii's Virtual Console service in 2007. These re-releases were well received: while some critics considered the relatively unchanged game to be outdated, other reviewers felt that the game has held up well over the years. Finally, the 3DS version was released in 2011, once again including Master Quest's rearranged dungeons (which were absent from the Wii and iQue versions) along with updated graphics and 3D effects. The Widescreen Hack has Projection and clipping issues that can be fixed with a Gecko Code. The graph below charts the compatibility with The Legend of Zelda: Ocarina of Time since Dolphin's 2.0 release, listing revisions only where a compatibility change occurred. This page was last edited on 1 March 2018, at 05:44.